30ytantos, ONDACERO – WITH PEPA GEA – Language: Spanish. 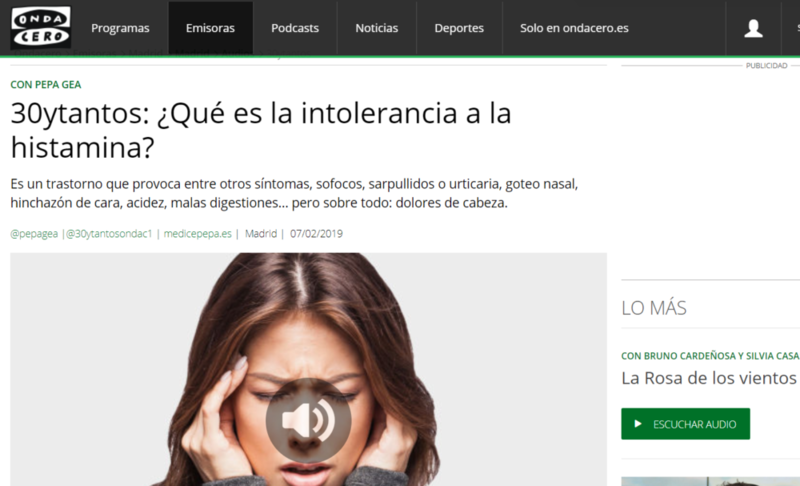 In this interview from the ONDACERO radio station in its program 30ytantos, Roser Sala, responsible for marketing of SYNLAB (european leader in management and services of clinical and pathological anatomy laboratories), explains what is histamine intolerance, which are their most common symptoms and how it is diagnosed. Here is the link to the podcast of the interview. The histamine intolerance is a disorder whose causes can be genetic, pharmacological or pathological and which produces diverse symptoms throughout the body. The genetic causes are due to mutations in the gene of the diamine oxidase (DAO), an enzyme that metabolizes histamine in the intestine, as a part of which is exogenous: from food, thus preventing to be absorbed by the bloodstream. These mutations discovered on the gene of the DAO reduce or prevent its activity, generating an accumulation of histamine. The pharmacological factors are related with the use of certain drugs that cause a deficit in the activity of the enzyme diamine oxidase, such as analgesics (aspirin) and tranquilizers (Diazepam). Certain inflammatory bowel diseases such as Crohn’s disease, Ulcerative Colitis and colon cancer make decrease the activity of the diamine oxidase to affect parts of the intestinal mucosa that produce it. All of these can be causes related to the different symptoms involving the histamine intolerance by DAO Deficiency, let`s now to know its symptoms. Migraines and vascular headaches are one of the most notable symptoms, since they are highly disabling diseases and in which is involved the deficit of DAO. According to clinical studies the deficit of DAO is involved in up to 87% of cases of migraine patients. This intolerance also causes effects on the rest of the systems, triggering a rash, urticaria, dry skin, or atopic dermatitis; hot flashes, dizziness, muscle fatigue, fibromyalgia; indigestion, heartburn, bloating, diarrhea, vomiting… and all the latest studies show that is also involved in the development of the Attention Deficit Hyperactivity Disorder (ADHD), due to the neuronal functions of histamine in the brain. The histamine is a molecule that we can be found in different food, but which we also manufacture within our cells and it is involved in various regulatory processes in our body. In fact the histamine is involved in the process of inflammation, in the regulation of the immune system, in the neuronal connections (acts as a neurotransmitter in the brain) and one of its most visible negative effects are allergies. With regard to its origin, as we have already commented the source of histamine is not only internally, but also externally, because it comes from the foods we eat and our digestive process. Rich histamine foods like chocolate, ripe cheeses, monosodium glutamate , the skin of fish, some fruits and nuts, fermented products or pickles, yeast and cured meats or processed contain it in large quantities. 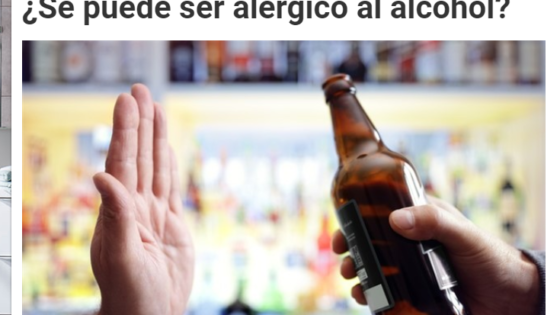 On the other hand, alcoholic beverages block the activity of DAO, preventing that it metabolice histamine in the intestine. In this way, there are people that in order to different causes (genetic, pharmacological or pathological) accumulate histamine in their body, triggering a series of symptoms such as migraine headaches, fibromyalgia, different gastrointestinal and skin disorders, and attention deficit and hyperactivity disorder. There are no tests to detect the allergy to histamine. What is done in hospitals is a measurement of the diamine oxidase activity in the body by the test MigraTest, Designed to know what level of enzyme activity the patient has and if it is within normal or pathological ranges. Patients should be placed in the hands of a doctor and nutritionist. This is the way to control the medication and diet of the patient, to receive recommendations and guidelines to avoid, to the extent possible, certain drugs and foods that are triggering or exacerbating symptoms caused by the DAO deficiency. This joint action allows a correct custom design of treatments that the patient requires for its particular pathological condition to the time that is deployed a diet that will try to feed properly and complete nutrition. To ensure the benefits of good management of feeding and nutrition for patients, there are dietary supplements of the DAO enzyme , which are functional foods that help to the metabolization of histamine in a natural way, without any side effect, and preventing it from to trigger all symptoms resulting from intolerance to the histamine by DAO deficiency. Some of these nutraceuticals have been designed and formulated for the specific treatment of certain diseases, such as migraine, fibromyalgia, intestinal dysbiosis, gastrointestinal and skin disorders or attention deficit and hyperactivity disorder. On the other hand, other causes of the DAO deficiency are related with the processes of the intestinal dysbiosis. The intestinal dysbiosis is the alteration of the microbiota of our intestines, the set of microorganisms that live and carry out their functions in our intestines naturally, and that in certain conditions are affected in the tasks involved. Among them we can highlight: the proper absorption of nutrientsa and its function as a barrier of defense against external pathogens such as parasites and viruses. The deterioration of the intestinal micriobita loses the integrity of the intestinal mucosa and can cause malnutrition, and in some cases malnutrition must be controlled from the beginning to avoid illness and highly negative effects. The intestinal dysbiosis can be caused by overconsumption of antacids, since these unbalance the intestinal pH (increasing it, making alkaline) causing an overgrowth of species that are not inherent in our intestine. The stress and overuse of antibiotics can also cause these processes of deterioration and alteration of our intestinal microbiota. In this way, due to the complexity of the variety of factors acting in these diseases, from the first moment patients should be in the hands of specialized doctors and nutritionists, make a diagnosis of DAO deficiency and perform a continuous control of both the medication, diet and living habits of the patients, since all of them are involved in the origin and worsening of these pathologies and their symptoms. 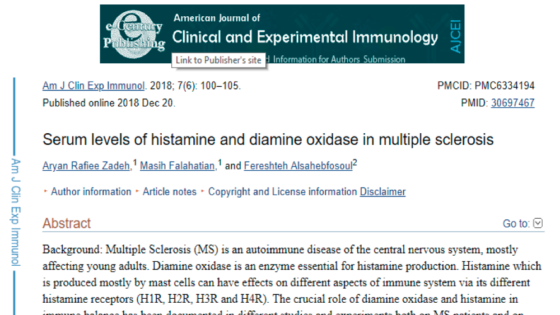 Finally, if is diagnosed a intolerance to histamine by DAO deficiency should be to supplement the diet with nutraceuticals that include diamine oxidase.  This is a council of the International Society of DAO Deficiency.